In 1620, the Mayflower landed at Plymouth rock bringing 102 Puritans. The new arrivals did not call themselves "Pilgrims" -- they called themselves “saints” because they thought of themselves as being God’s elect. Only in the 20th-century did “Pilgrim” come to refer to the Mayflower Puritans. These Puritans settled in an area that was once Patuxet, a Wampanoag village. It had been abandoned four years prior because of a plague that had earlier been brought by European traders. Before 1616, the Wampanoag numbered 50,000 to 100,000, occupying 69 villages scattered throughout the region that is now southeastern Massachusetts and eastern Rhode Island. The plague killed up to two-thirds of them. Many also had been captured and sold as slaves. The English did not see the Wampanoag that first winter at all. They only caught a rare glimpse of a fleeting shadow of the land's inhabitants until March 1621 when Samoset, a Monhegan from Maine, came to the village. The next day, he returned with Tisquantum ("Squanto"). Tisquantum had been abducted as a boy in 1614 from the very village the Mayflower Puritans found abandoned. Tisquantum was sold as a slave in Spain, then escaped to England. After several years was able to get back to Turtle Island (what we call North America). When he returned to his village, he discovered there were no other surviving Patuxet -- the rest were either killed in battle or died of disease brought from Europe. He’d learned English so he could talk to the settlers and serve as a translator. He showed them how to plant corn, fish and gather berries and nuts. The crop seeds the colonists had brought with them failed, so without Tisquantum’s help, there probably wouldn’t have been a harvest to celebrate that fall. The Puritan colonists did not wear black, large hats with buckles on them, nor buckled shoes. The 19th-century artists who painted them that way did so because they associated black clothing and buckles with being old-fashioned. Actually, their attire was bright and cheerful. The harvest celebration on 1621 was not a solemn religious observance. It was a three-day festival that included drinking, gambling, athletic games, and even target shooting with English muskets -- a not-so-subtle way to warn the indigenous peoples that these colonists could shoot them. The Wampanoag chief, Massasoit, and 90 warriors made their way to the settlement in response to the sounds of the gunfire. They thought the colonists were under attack, so they came prepared for battle to help defend the colonists. The Wampanoag were probably not invited, and the settlers were probably rather nervous having them around. An 11-foot high wall had been erected around the entire Plymouth settlement for the very purpose of keeping the indigenous peoples out. Moreover, mere days before the feast, a company of settlers led by Miles Standish had actively sought the head of a local Indian leader. The Wampanoag were not wearing woven blankets on their shoulders and large, feathered headdresses. They wore breechcloth with leggings -- and perhaps one or two feathers in their hair in the back. The main course was venison, rather than turkey. The Wampanoag stayed for three days, during the course of which they contributed five deer. There are references to "fowl" -- which would have included ducks, geese, and various birds -- so it's possible that some turkey could have consumed, albeit without cranberry sauce. 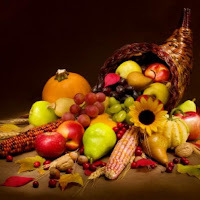 Other foods that may have been on the menu: cod, bass, clams, oysters, Indian corn, native berries and plums, all washed down with water, beer made from corn, and another drink the settlers called “strong water.” Pumpkin pie? Nope. In those days, the settlers boiled their pumpkin and ate it plain. They didn’t have flour mills to make flour for a crust, nor cane sugar, nor the "pumpkin pie spices" (cinnamon, nutmeg, clove). The 1621 harvest celebration was not in November, which would have been much too late. It was some time between late September and the middle of October. Everything we know about that 1621 feast came from a description in one letter by colonist Edward Winslow. That letter was lost for 200 years. After it was rediscovered, a Boston publisher, Alexander Young, in 1841 printed up the brief account of the feast. Young dubbed the episode “The First Thanksgiving.” White Americans, craving a romanticized story of their past, latched on to it. The colonists celebrating in 1621 did not call their event "Thanksgiving." For them, “thanksgiving” was a day of fasting – and this was a feast -- the opposite of their thanksgiving observance. Calling any event involving white settlers in North America "the first Thanksgiving" overlooks the fact that, for thousands of years before Europeans arrived, Indigenous people throughout Turtle Island (North America) celebrated seasons of Thanksgiving. 'Thanksgiving' is a very ancient concept to the first nations of this continent. The 1621 celebration was a one-off that was not repeated -- and, in any case, wasn't thought of as a "Thanksgiving." The first European-recognized Thanksgiving came in 1637, when Governor Winthrop of the Massachusetts Bay Colony proclaimed a Day of Thanksgiving. There is no historical link between today's holiday and the 1621 celebration. The linkage is purely mythical, created in 1841 by publisher Alexander Young. The historical roots of our current holiday begin, instead, in 1637. In 1637, Governor Winthrop proclaimed a Day of Thanksgiving. The proclamation focused on giving thanks for the return of the colony's men who had traveled to what is now Mystic, Connecticut where they had gone to participate in the massacre of over 700 Pequot men, women and children. The thanks that was foremost in Winthrop’s proclamation was thanks for their “great victory”. The roots of the American Thanksgiving holiday are a celebration of the massacre of hundreds of Native people. It grew into a general celebration of genocide. For example, a Proclamation of Thanksgiving in 1676 thanks god that the "heathen natives" had been almost entirely wiped out in Massachusetts and nearby. A century later, the Thanksgiving Proclamations weren't about genocide of the indigenous peoples -- that was no longer a concern. The proclamations did, however, continue to be connected with violence. The Continental Congress, in the midst of the Revolutionary War, issued Thanksgiving Proclamations each year from 1777 to 1784. The 1777 proclamation, for example, declared it an "indispensable duty" of all "to acknowledge with gratitude their obligation to" God and to "implore such farther blessings as...to...smile upon us in the prosecution of a just and necessary war." "implore the interposition of the Almighty Hand to heal the wounds of the nation and to restore it as soon as may be consistent with the Divine purposes to the full enjoyment of peace, harmony, tranquility and Union"
-- which seems an implicit request for God's favor on the Union Army in battle. Lincoln set the US National Holiday of Thanksgiving as the last Thursday of November. The holiday moved from the last Thursday to the fourth Thursday in 1941. Franklin Roosevelt made the change because November 1941 had five Thursdays, and by moving the holiday up a week he gave merchants a longer Christmas shopping season that year -- and all subsequent years with five Thursdays in November, which occur, on average, twice every seven years. In 1970, the Commonwealth of Massachusetts was arranging celebrations of the 350th anniversary of the Plymouth Rock landing. Wampanoag Wamsutta (Frank) James was invited to speak -- then disinvited after the event organizers discovered his speech was one of outrage for atrocities and broken promises. So instead of participating in the official proceedings, Native people gathered at Cole’s Hill overlooking Plymouth Rock. Every year since, Native Americans have been gathering there from around the country at noon on the fourth Thursday of November to observe a National Day of Mourning. There’s nothing wrong with gathering with loved ones to give thanks for our blessings and sharing a meal. After all, Native people have done so for thousands of years. But when we do, let us acknowledge the true origin of this holiday. Along with remembering all the good in your lives, all the blessings you enjoy, remember also the pain, loss, and agony of the Indigenous people who suffered at the hands of those Puritans now called “Pilgrims'. And when you list your gratitudes, include thanks that you have the capacity to face the truths of the past, to learn from them to love others better, and love the rich diversity of humanity.